Possibly because of the influence of early and beautiful children's books I always think of swans swimming on beautiful streams and lakes. 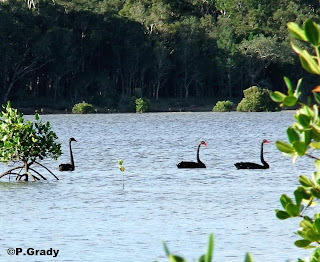 However, Black Swans (Sygnus atratus) are also occasionally found here on the bay. I saw my first one down here a few years ago before I had a camera with a long lens. Then about 18 months ago I saw a group of six of them just south of the Mullens picnic area. They were directly against the light so the photos were more like silhouettes than colored photos. 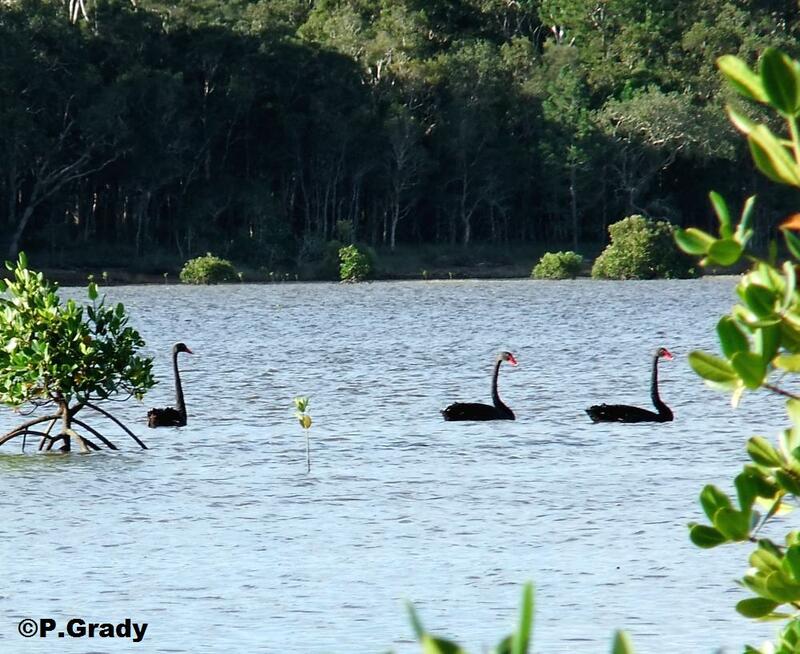 Then a couple of weeks ago Peter told me he had seen some right in the area where the shorebirds roost at Mullens. Peter has an enormous and very practical amount of local knowledge. (See this post about catching crabs.) He also has a very quick eye for noticing anything different about the birds and the local environment. Peter said I could post his photo as I didn't get down to the bay until the swans had moved on again. Sometime I hope I am in the right place at the right time to get some really good photos of these beautiful birds for myself. Striking birds, the swans we see are white tundra swans. They think California is a great place to spend the winter. 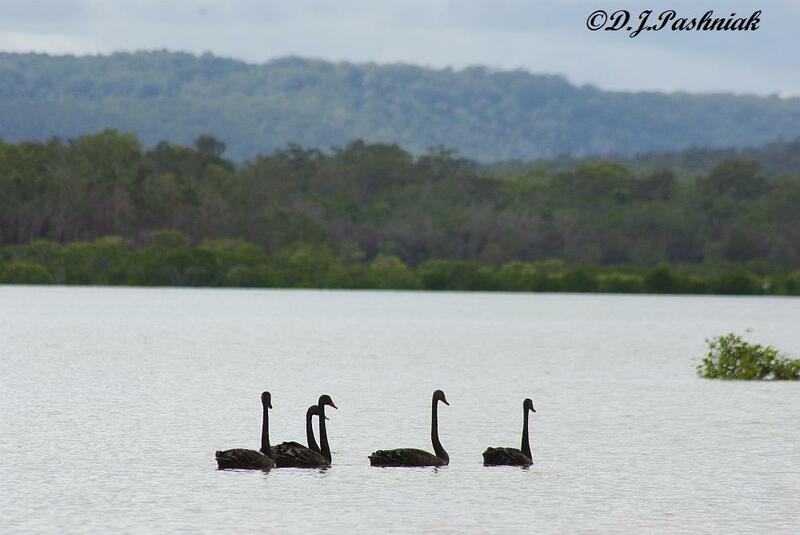 I think all swans are beautiful - whether white or black. 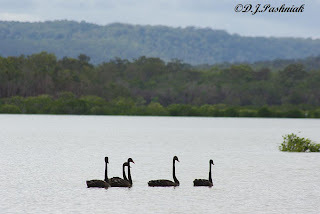 Your Black Swan photos show the elegance of these birds very nicely! They do not swim close to the shore, so it is not easy to take a closer photo of them even with a big telezoom lens I think. Thanks Muge. The best photos I have got of Black Swans are in at the ponds in the Gympie city park where the birds get used to people all around. 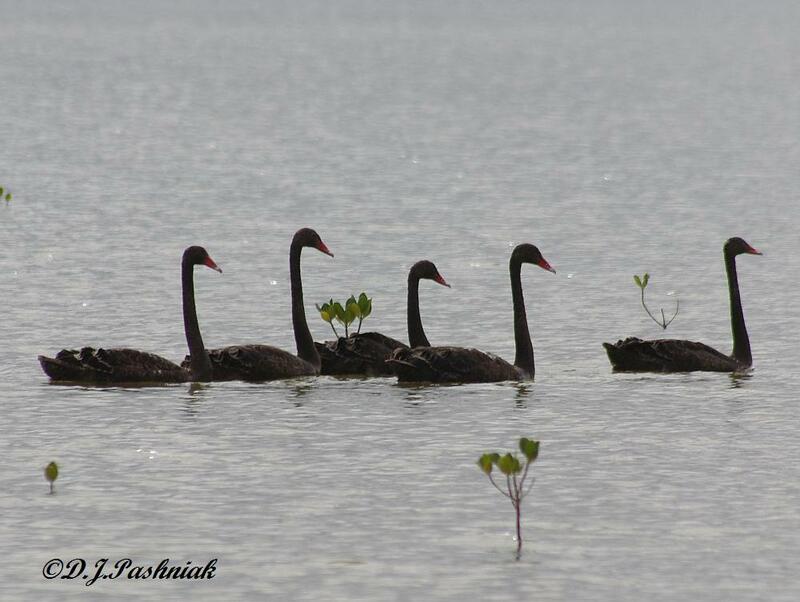 it is very rare to see black swans in Sweden. If there is one it is probably brought here by somebody. What beautiful birds. They look so elegant. Beautiful birds. I hope I'm fortunate enough to see them some day..
Godwits - with a difference.